Posted September 8, 2018 by laurielmorrison & filed under Every Shiny Thing, Middle Grade Literature, Up for Air. Today is rainy and the tiniest bit chilly, and I’m loving the cozy, stay-at-home weather. It’s starting to feel a bit like fall, and I’m excited to think about beginning a new season. In the midst of these big tasks and transitions, I haven’t been blogging here, but I have done a few interviews I’d love to (belatedly) share, and I have some exciting news about my second book, Up for Air! 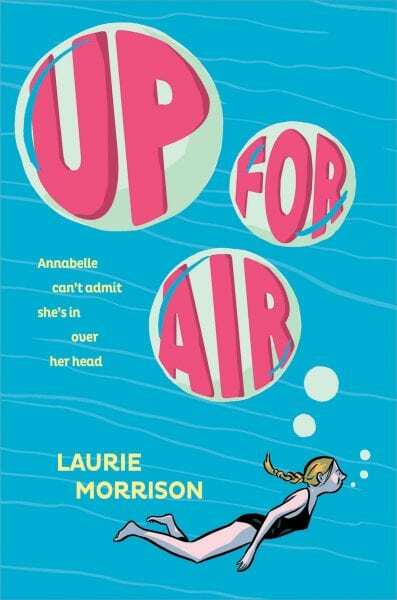 Up for Air has a beautiful, vibrant cover and a publication date: May 7, 2019! If you’d like, you can add it on Goodreads and/or pre-order it on Barnes & Noble, Amazon, or IndieBound! It’s an upper middle grade novel about competitive swimming, shifting friendships, developing bodies, the social pressures of having older friends, and an intense crush. It’s a book that means the world to me, and I can’t wait to share it with readers! If you’d like to know more about it, you can read this interview I did on MG Book Village about how my former students inspired me to write the book, why I love the cover, and why I think upper middle grade novels are so important. Cordelia and I have also done two more interviews about Every Shiny Thing (which, unbelievably, has now been out in the world for 4.5 months!). We did this one with the wonderful, eternally supportive L. Marie way back in June. And then more recently, talented author A.B. Westrick asked us all about our do’s and don’ts for collaboration in this interview, which includes a giveaway you can enter up until September 18th if you’d like to win a copy of Every Shiny Thing. Thank you, as always, for reading my bookish news and sharing in my excitement, and happy almost-autumn to you all! Yay, Laurie! I added it to Goodreads. I cannot wait for the debut of this book! I loved doing that interview with you and Cordelia! I learned a lot. Now I’m looking forward to reading UP FOR AIR!